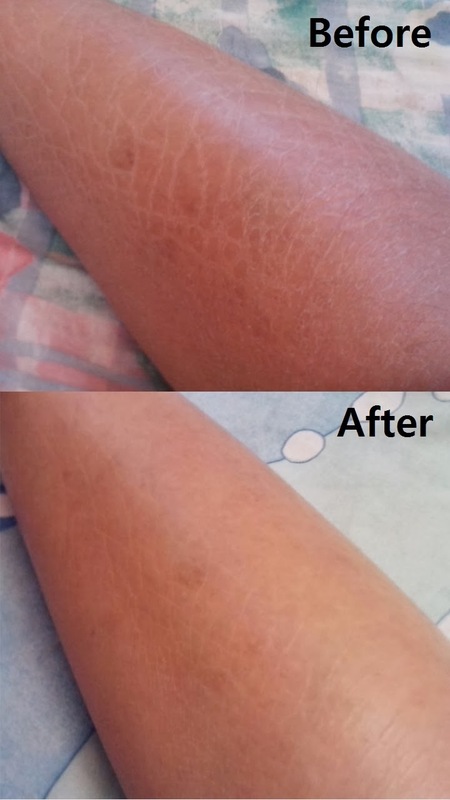 Coping with Ichthyosis: 08022014: Does shaving helps the skin shed? 08022014: Does shaving helps the skin shed? So during CNY we wear new pretty and new clothes, naturally as a lady I would love to wear skirts and dresses, not to mention Cheongsam (traditional Chinese dress)! I don't have really hairy body, meaning I rarely shave because it's unnecessary, plus I wear long jeans or leggings most of the time. Once in a while when I want to wear dress or skirt I will shave/wax my legs and one thing I found out, everytime after I did that, my skin is super smooth! I told my Mum about it and she said maybe because I cleared the hair follicles and makes the skin shedding easier. But of course I can't shave everyday, not only it is time consuming but it actually grows kinda slow. No point of shaving if there is nothing right? So after a week or 2 after shaving, it goes back to square one. Rough and cracked skin. So just wanna share on how different it looks like before and after shaving. These were taken under the same lighting of my room. The "Before" is before I shave my legs, hair is fine so not quite visible but you can still slightly see. "After" is a day after I got them shaved! There is a patch of darker pigmented area as you can see at the center. So after I shaved, I went out visiting in my favourite skater mini skirt! But there was still slight insecurity, I avoid bright places just so I can hide my skin a lil. But still, if you have an emergency, try shaving and slab on lots of hydrating lotion. You might get smooth skin for at least 3 days! Hi there! I live in the US and I have Ich Vulgarius as well. I started dating my now husband 5 years ago and we've been happily married for 2. I think I care more about my skin then he does and I'm learning (slowly) Ichthyosis doesn't define your life it just changes how you treat it. Somedays I look/feel perfectly normal too :) I was initially diagnosed with Eczema since early childhood. I just wanted to give you some of my personal advice and express that you are not alone but remember all treatment is really personal preference. I take a shower long enough to fully moisturize the skin so it can be removed easily, maybe 30 min every other day. This is longer then my previous doctor recommends. I use moisturizing body wash with Shea Butter. I do shave and find it feels better on my lower legs. After I pat dry and start with spot treating the eczema with medicine, then use all over Ammonium Lactate 12% (stings a little) and then cover all over with Eucerin cream. Some people swear by Aquaphor which is made by Eucerin but is more like a Vaseline consistency. Anyway, I usually re-moisturize during or at the end of the day and then the next day when I don't take a shower. Then I start the process all over. Check out Ichthyosis.com for lots of tips physically and emotionally, as it has helped me SO MUCH, best of luck on your journey! Thank you for your suggestions! My SO also didn't mind my skin condition as much as I do, and I feel like we are really lucky because I always thought fair and smooth skin is everything for women to look great. It is great to have such supportive SO.